Carolus Linnaeus’s first, or 1735, edition of Systema Naturae is the “In the Beginning” text of animal and plant classification. 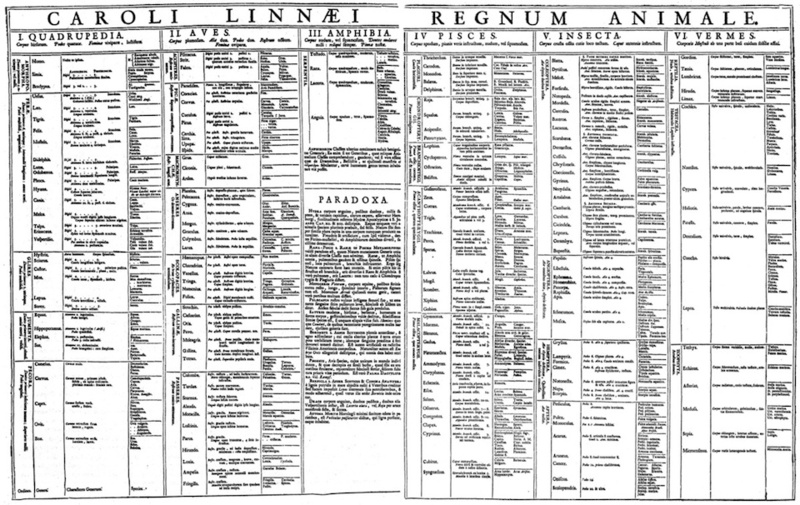 Shown is a scan of Table of the Animal Kingdom (Regnum Animale). A cat is, of course, a cat. Lions are cats too, as are leopards, lynxes and so on – the “Felidae” family contains 41 species in total. But what about other closely related species such as hyenas or mongooses? These animals are not in the cat family: they are cat-like “Feliformia”, but are in their own separate families. So why are some species grouped together in the same families and others separated into different families? It might surprise you to learn that there is no general answer to this question, despite the fact that we now know a lot about evolutionary relationships for groups like mammals. Science has moved on and so should the way we classify life on earth. The science of “taxonomy” categorises species (such as Homo sapiens, in the case of humans) into broader groups such as orders (for example primates) or kingdoms (for example Animalia). Current approaches date back to 18th century Swedish biologist Carl Linnaeus. Linnaeus saw all living things as creations of god and sorted them into hierarchical groups according to how similar or different he perceived them to be. Evolution hadn’t even been theorised in Linnaeus’s lifetime. These days, we have a huge amount of DNA and fossil data to map out how, and when, one species branched out from another. Modern taxonomists therefore aim to base their decisions on evolutionary relationships, but the process remains subjective and there has been no attempt to standardise practises across all species on earth. Taxonomic groups such as birds and mammals represent “classes” under current classification systems, which are then subdivided into orders, families and genera. Our research uses the latest evolutionary trees for birds and mammals to demonstrate that current taxonomic classifications are highly inconsistent. To resolve this issue, we can use evolutionary trees directly in order to consistently create taxonomic ranks. We applied a technique known as “temporal banding” to the bird and mammal trees, producing new classifications that reduce amount of evolutionary divergence within groups to a minimum. Under these new schemes, 70 per cent of bird groups and 61 per cent of mammal groups need to be revised. Biologists have generally determined the major taxonomic orders fairly consistently – we found that the big groups, such as parrots, hummingbirds and swifts, rabbits and hares, opossums and so on, have been made in a fairly constant manner. But classification can zoom in much further than this – there are 372 species of parrot, for instance, grouped into 86 genera. These more specific groupings are sometimes not much better than if they had been defined at random. Our study considered relationships within taxonomic groups that scientists use on a daily basis. This isn’t just a debate for scientists though, as these classifications have an important impact on what species we choose to study and how we communicate our observations of the natural world. The New Zealand rockwren (Xenicus gilviventris) provides an excellent example of this. These are fairly unique species, not closely related to other species of wren, and are of conservation concern. When we classified bird species in a consistent manner, New Zealand rockwrens became their own taxonomic order, highlighting their evolutionary uniqueness to everyone. In another example, the dog family (Canidae) and the cat family (Felidae) currently have similar numbers of species but, under our standardised system, the cat family is expanded to include civets, hyenas, mongooses, fossas, and other relatives. As a result the new cat family contains four times more species than the dog family, which remained unchanged. Since these new families are defined on a consistent basis, they tell us something about the evolution of these groups: cats have diversified far more than dogs over a similar time period. An example from the birds sees the owls, which are currently in the order Strigiformes, split in to two new orders: barn owls and true owls. These two groups are too distantly related to be lumped together. Such grouping by evolutionary divergence is controversial and many taxonomists will still feel that classifications should be focused on physical characteristics – what we call morphological similarity. However, this focus on what animals look like just adds inconsistency. A classification system based on morphology makes sense in theory, but in practise it leads to a high level of subjectivity. It is hard to imagine an objective approach based on morphology that could be applied across the entirety of life on earth. How could someone evaluate the physical difference between a bacterium and an animal? We are currently undergoing a revolution in DNA technology and our understanding of the tree of life is improving quickly. Our study demonstrates an approach that can consistently incorporate this information into the way we classify and view the natural world. Ben Holt receives funding from the Grand Challenges in Ecosystems and Environment Initiative, www3.imperial.ac.uk/ecosystemsandenvironment/grandchallenges. Knud Andreas Jønsson receives funding from the People Programme (Marie Curie Actions) of the European Union’s Seventh Framework Programme (FP7/2007-2013) under REA grant agreement n° PIEF-GA-2011-300924. Knud Andreas Jønsson is affiliated with Department of Life Sciences, Imperial College London, Silwood Park campus, Ascot SL5 7PY, U.K; and Department of Life Sciences, Natural History Museum, Cromwell Road, London, SW7 5BD, UK . You’ll find lots of great free stories inside our site, but most of our original words and images are behind a paywall — we do not sell advertising, and reader payments are essential for us to continue our work. If you appreciate our site, please help sustain us. Journalism to has value, and a day pass is $1, while subscriptions start at $2.95/month, less than a cup of coffee.